A lot of people think about making resolutions for themselves at the beginning of the year. I have some ideas that you could think about for our pets. Brushing teeth: Dental health is always a concern with our dogs and cats. Many pets have trouble with build up on their teeth which can result in infection and tooth loss. There are a variety of tooth brushes available for different sized dogs and cats. The important thing is to make sure to use tooth paste for pets. Human tooth paste has things that could be too much for our pets. Also, a lot of the pet tooth pastes are flavored so they will like them. Another option is to use dental treats like Greenies or the T/D diet from Hills. Exercise: Another common issue with our pets is obesity. Sometimes playing with our pets or taking them for walks is a good way to help burn calories. Going for walks is also beneficial for dogs because it provides mental stimulation. 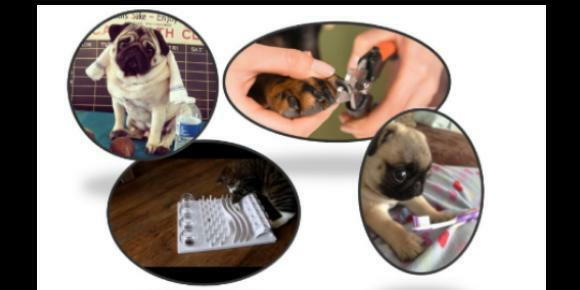 Husbandry training: Work with your pets on desensitizing them to getting ears cleaned, nails trimmed, brushing. I have worked with zoo animals that have been trained for numerous husbandry behaviors. These are not restricted to wild animals, we can train our pets to accept a variety of husbandry behaviors as well. In the end, this will be less stressful for you, us, and your pets. Enrichment: Find fun ways to engage your pets’ minds. Use puzzle feeders for food or treats, play hide-and-seek with treats around the house, etc. This is especially important with our bird pets. In the wild, they spend most of their days looking for food. When we provide their diet in a bowl, there is a lot of free time which could lead to feather plucking and other behavior issues. If these raise any questions or if you would like some suggestions to start any of these, please contact our office. Best of luck to you and your pets in the upcoming year!